Most silver products were stronger in the latest weekly United States Mint numismatic product sales report. The 2013 Reverse Proof Gold Buffalo makes its second appearance, and two new products debut. Weekly sales for numismatic American Silver Eagle and America the Beautiful Five Ounce Silver Coins were stronger compared to the prior week nearly across the board. This was led by the one ounce 2013 Proof Silver Eagle, which saw weekly sales of 18,443, nearly double the total of the prior week, bringing cumulative sales to 670,813. The 2013-W Uncirculated Silver Eagle added 1,822 units, bringing the cumulative sales total to 127,433 units. 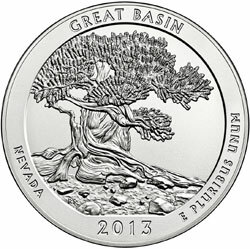 Weekly sales reached nearly 2,000 units across the three available ATB Five Ounce Silver Coins. The strength in silver numismatic products may be attributed to the recent higher market price of the metal. As opposed to gold and platinum products, silver products only see their prices adjusted periodically following substantial moves in the price of the metal. Current prices were established when the market price of silver was around $20 per ounce, meaning that the products have comparatively lower premiums with the price of silver now higher. Some collectors may also be anticipating a possible price increase for silver products, which may occur if the strength in the market price continues. Elsewhere in the report, the 2013 Reverse Proof Gold Buffalo makes its second weekly appearance, with cumulative sales rising to 34,086 units as of August 20, 2013. This amount is now more than 20,000 units greater than the total sales for the regular proof version of the coin. Sales for the reverse proof are scheduled to continue until September 5, 2013 at 5:00 PM ET. On this week’s report, two new circulating coin sets make their debut. The 2013 Presidential Dollar Sets containing Philadelphia and Denver Mint coins opened at 3,311 and 2,159 units respectively. These products carry limits of 18,000 and 15,000 units. Thanks for the post Michael. Watch those numbers roll. Hopefully we will see some sell outs soon.